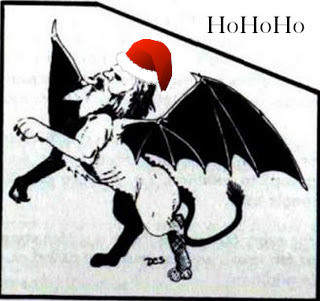 Every hour from now til midnight PST, there’s a new Santicore present at the Santicore blog. Space Hyenas, Gorgons from Space, a UFO Table, Adventure Generating Tables Potion Mishaps, a Mole-Man Character Class–these are but a few of the treasures that await you today. The 2011 Santicore is available in PDF. Also, I haven’t forgotten about “bring it.” I’ll be making a big post later today. …Christians sought to close the distance between themselves and God by engaging in physical travel toward a spiritual goal. Such journeys served a variety of functions: a pilgrim might set out to fulfill a vow, to expiate a crime, to seek a miraculous cure, or simply to deepen his or her faith. None of these purposes is specific to Christian pilgrimage—the idea of the sacred journey is a feature of many religions—yet by the fourth centuryA.D., pilgrimage had become a recognized expression of Christian piety. Pilgrimage in Medieval Europe | Thematic Essay | Heilbrunn Timeline of Art History | The Metropolitan Museum of Art.